These beautiful, hand-painted, virtually indestructible hard resin shells perform the traditional shell game with a hard, 1 3/4" pea, and yet the effect is all mechanical - there's no sleight-of-hand required. That's correct - it's practically self-working! 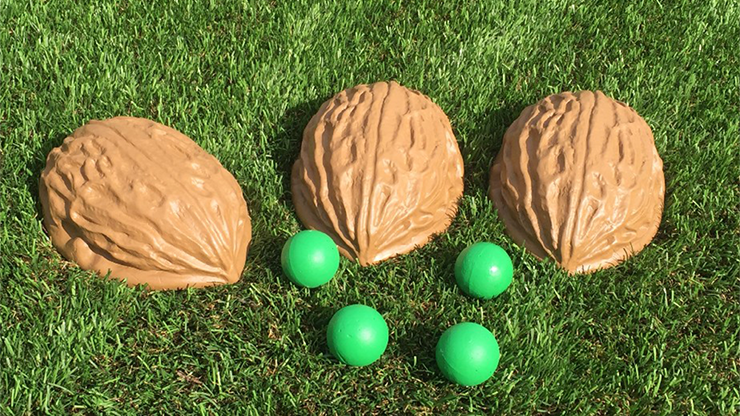 - Three jumbo shells measuring an incredible 8"x6" and 2 1/2" deep! - Includes a DVD of Chef Anton and Whit Haydn's audience-tested routine and advanced handling tips! "Visual, practical, and incredibly commercial! This prop is a people magnet! I already have a dozen ideas!" May contain either smooth or fuzzy textured peas.